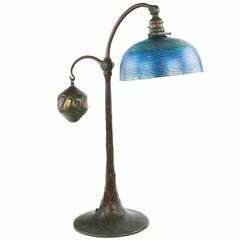 A Tiffany Studios New York "Counter Balance" glass and bronze lamp, featuring a green Favrile glass "Damascene" shade on a turtleback counter balance "Tyler" base, circa 1900. 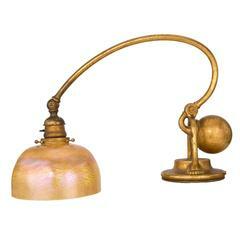 A similar lamp is pictured in: The Lamps of Tiffany, by Dr. Egon Neustadt, New York: The Fairfield Press, 1970, p.41. A similar base is pictured in: Tiffany Lamps and Metalware: An illustrated reference to over 2000 models, by Alastair Duncan, Woodbridge: Suffolk: Antique Collectors' Club, 1988, p. 87, plate 341. circa 1905. Shade signed: "L.C.T. Favrille". Base signed: "Tiffany Studios New York".